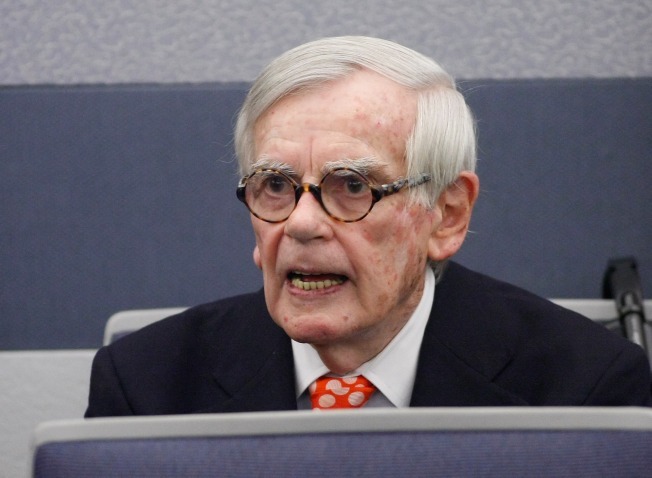 Dominick Dunne could always be seen in courtrooms -- dashingly dressed. Best-selling author, journalist and Connecticut gadfly Dominick Dunne has died. He was 83. His son, actor-director Griffin Dunne, said that his father had been battling bladder cancer for some time. He died Wednesday at his home in Manhattan. Dunne wrote about the outrageous crimes of the rich and famous set, through magazine articles and novels. Among them is the murder of teenager Martha Moxley in Greenwich in 1975. Her death prompted him to write "A Season in Purgatory," in the 1990s and he was instrumental in helping make the case against Michael Skakel, Newsday reports. Dominick Dunne didn't let his cancer stop him from working. In September, against his doctor's orders and his family's wishes, he flew to Las Vegas to attend O.J. Simpson's kidnap-robbery trial -- a postscript to his coverage of Simpson's 1995 murder trial that spiked Dunne's fame. In the past year, Dunne had traveled to Germany and The Dominican Republic for experimental stem cell treatments to fight his cancer. Dunne discontinued his famed Vanity Fair column in order to finish another novel, "Too Much Money," set for release in December. He had begun to write his memoirs and, through aides, was posting messages on his own site. In early August, he wrote: "I decided on Sunday last to return to Germany for further stem cell treatment for the cancer that I have been fighting ... I am happy to be returning to the clinic because I have found the treatment there to be wonderful." Born in 1925 in Hartford, Conn., Dunne was part of a famous family that included his brother, novelist and screenwriter John Gregory Dunne; his brother's wife, author Joan Didion; and his son, Griffin. His actress daughter, Dominique Dunne, was slain in 1982 when she was 22.